In the extreme south of Argentina lies Patagonia, a region which encompasses every imaginable climate and terrain from turquoise rivers and lakes to desert and glaciers. Below the 'Cordillera', the pristine snow capped mountain range of the southern Andes which separates Argentina and Chile, lies the flat and fertile expanse of the pampas on which sheep and cattle graze. In this area live the Mapuche. Known as the 'Gente de la Tierra' (People of the Earth), this indigenous population has lived on both sides of the mountains without concern for nationality for 10,000 years. For the last 500, they have resisted continual invasions, extermination attempts, and land grabs. In 1879, over 1,300 Mapuche were massacred and their land confiscated for English immigrants in a genocidal war, 'La Conquista del Desierto' (The Conquest of the Desert). During this campaign, the Argentinian state divided up the majority of the stolen land into 8,000 square kilometre lots, and handed over 41 million hectares to less than 2000 settlers. 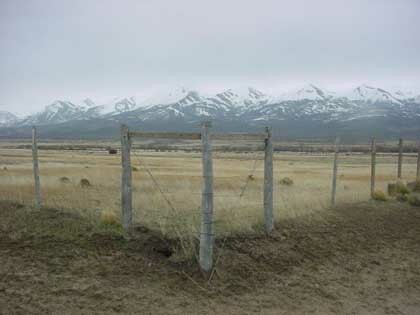 In subsequent years, Patagonia became a private dominion for foreign and Argentinian landowners. Decimated, the surviving Mapuche were condemned to live on the worst land, taking refuge in the coldest and most inhospitable areas along the mountain range. Today, the Mapuche are facing a new conquest as rich Europeans and North Americans arrive to take advantage of the low prices and open economy established under the globalization-friendly presidency of Carlos Menem in the 1990s. In the last few years figures such as Ted Turner, Jerry Lewis, Sylvester Stallone, Christophe Lambert, and George Soros have become Patagonia's new landlords. Among the new owners of Patagonia two brothers stand out, both for the amount of land they have managed to buy and for the agreement they have reached with Mapuche families living nearby. These two brothers are Carlo and Luciano Benetton. The Benetton Group is today the largest landowner in Argentina, with 900,000 hectares (an area equivalent to 900,000 football fields) in resource rich Patagonia. With nine percent of the region's most cultivatable land, their holdings are 40 times the size of the capital city, Buenos Aires, the second largest city in Latin America. Benetton not only has clothing outlets in 120 countries, but also controls freeways and telecommunications companies in Europe. With a total of 7,000 retail stores and production figures of 100 million articles a year, Benetton's average yearly revenue is 7 billion Euros. 'Patagonia gives me an amazing sense of freedom,' said Carlo Benetton on taking posession of his new Argentinian territory. But Benetton gets more than just a personal sense of liberty out of their ranch land: Benetton's 280,000 sheep produce 6,000 tons of wool a year, ten percent of its production needs. Seven hundred meters away from the Leleque Museum live the Curiñancos, a Mapuche family who found themselves on the wrong side of Benetton's 'amazing sense of freedom.' After the expropriation of their land in the 19th century many Mapuches moved to the cities and became factory workers, a few remained behind as subsistence farmers while today, under Benetton, some Mapuche farmers work producing wool for a pitiful wage. Like other Mapuche, Atilio Curiñanco made the journey to the city. 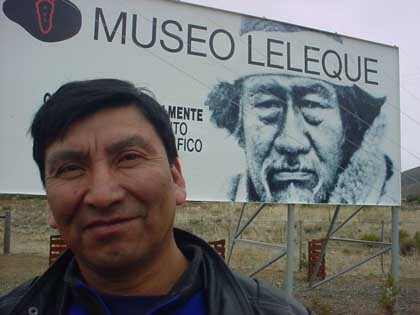 Born and raised in Leleque, he later moved to nearby Esquel. 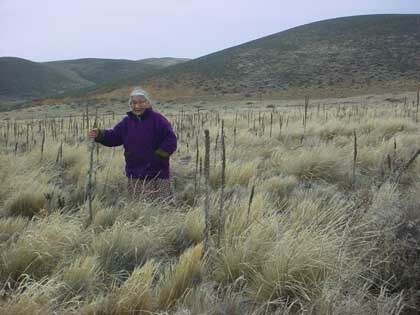 After suffering in the slump that succeeded Argentina's economic crisis in December 2001, 52-year-old Atilio and his wife Rosa decided to return to the fields. They would attempt to grow their own food, raise animals, and start a micro-enterprise. The Curiñancos contacted the Instituto Autárquico de Colonización (IAC), a state managed real estate agency, to request permission to occupy a piece of ranch land called Santa Rosa, situated in front of a Benetton property. The land was well known to the Mapuches as unoccupied indigenous territory and the IAC verbally confirmed this. After waiting 8 months, the Curiñancos still had not received a written response about the Santa Rosa property. When, in August 2002, the IAC finally presented a note to the family stating that 'information has been obtained that leads us to believe that the property is zoned commercial,' and that 'our interest is to reserve it for a micro-enterprise,' the Curiñancos decided to go ahead with their plans. On 23 August, they showed up at the Esquel Police station in Chubut and made it known that they would be occupying Santa Rosa. The same afternoon a group of campesinos began to work the land with the little resources they had, to plow, sow vegetables, and raise animals. On 30 August, however, the local Benetton office declared that the Santa Rosa ranch was their company property. Benetton issued a report claiming that the estate was not to be used for cattle rearing and stated their intention to take control of the property. After two months, the police dismantled and seized the Curiñanco’s belongings and the family returned to Esquel. The Benetton land surrounding the property remains unoccupied today. 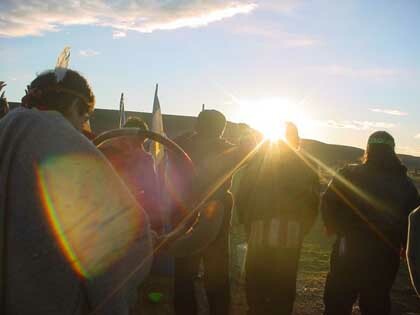 The Curiñancos, however, say that they will return to the land that was taken away from them, and refuse to let Benetton redraw the lines of their history. Across the dusty highway from the Santa Rosa property, Atilio's 85-year-old mother, Doña Calendaria, has to jump the fence of the Benetton property to access water from the area's only stream. 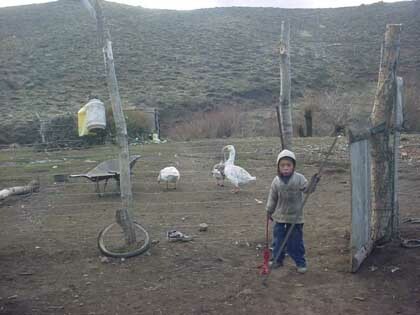 Leleque is a village of 8 families, most of whom but not all are Mapuche. They used to work for the Argentinian railroad company loading wool, leather and other goods for transport to the capital city. In 1992, a year after Benetton bought the surrounding property, the loading stop in Leleque was closed. 'This used to be a beautiful town, but now it looks like a cemetery,' says Calendaria's neighbour, Pichón Llancaqueo. When the loading station was shut down, running water for the families was cut off, and police stopped serving the area. The local cemetery is now part of the Benetton estate, in the yard of the Leleque Museum. Without work, drinking water or land to grow food, the inhabitants of Leleque had only their animals to help them survive. Then, at the end of September 2003, the state passed a resolution prohibiting the village's inhabitants from keeping animals. The same month Leleque's 50 inhabitants were told by the state owned railroad company that they had three months to abandon their homes to make way for a tourist attraction which would use the very houses that they occupy. 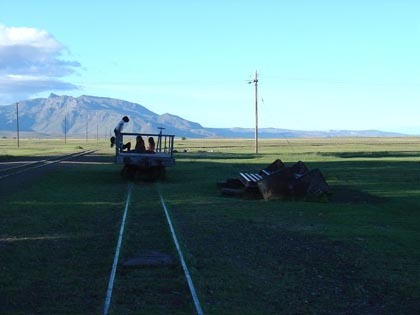 This tourist project, supported by the province of Chubut, involves reactivating the disused train lines for a guided train tour of Patagonia. Although provincial officials deny that the project has any relationship with Benetton, one of the highlights will be a trip through the picturesque landscape they now own. The official description of the tourist project describes 'a true trip through the regions origins, leaving from El Maiten heading towards Leleque. There you will visit the Museum Leleque, where one can enjoy a Patagonian asado [typical Argentinian food] at the Benetton ranch.' To make room for all this authenticity, a school for 18 pupils in Leleque will also be shut down. Meanwhile, the state is promising to rehouse the evicted residents. Miguel Mateo, spokesperson for the Ferrocarril Provincial del Chubut (Provincial Railroad Company of Chubut), presents the process as a simple relocation: 'I don't like to use the word eviction, it implies that the people are being thrown out into the street.' But given the state's previous record, even this is not guaranteed.